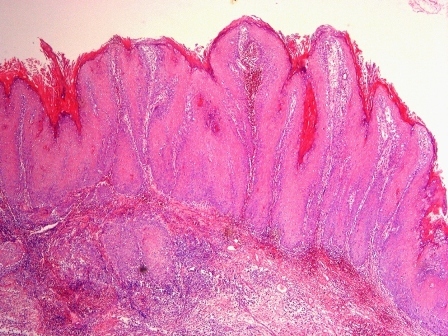 This email is sponsored by Pathology Service Associates, LLC (PSA), who invites you, and members of your practice, to participate in the PSA hosted Audio Conference titled �Specialty Physicians are Competing for Your Pathology Revenue, How Will Your Practice Respond and Maintain Business?�� This call will be presented by Jane Pine Wood, Esq., of McDonald Hopkins Co., LPA, and Al Sirmon, CPA, President and Chief Executive Officer of PSA, LLC. 1.5 CME credits have been designated for this call. To enroll, visit us at http://www.psapath.com/. 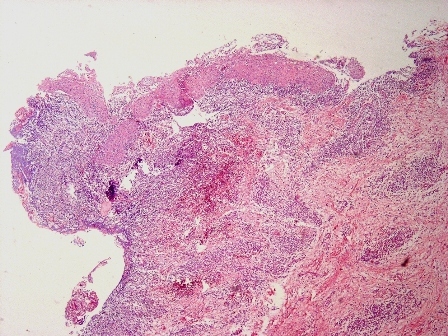 Low and medium power magnifications show squamous epithelium with marked papillomatous and acantholytic hyperplasia (figure 2;� figure 3). 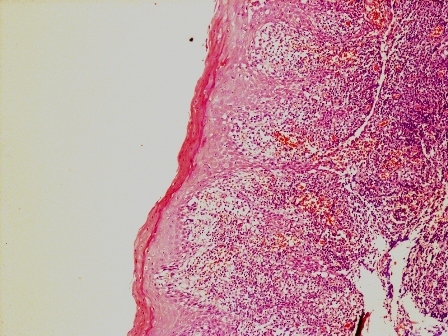 �Superficial stromal invasion by solid nests of well differentiated squamous carcinoma is present (figure 4; figure 5).� A residual squamous epithelial lining with chronic inflammation, belonging to a dentigerous cyst, is present (figure 6; figure 7). 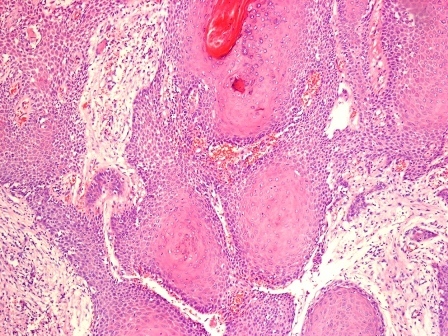 This is one of the few cases of verrucous carcinoma arising as a primary intraosseous odontogenic carcinoma of the mandible or maxilla within a dentigerous cyst (a cyst that surrounds the crown of an impacted tooth).� See also Tumori 2001;87:444 and Oral Surg Oral Med Oral Pathol 1980;49:151.� Primary intraosseous odontogenic carcinomas are usually squamous cell carcinomas within the jaw, without a connection to oral mucosa. 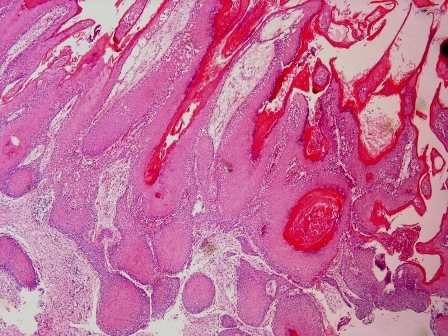 �They develop from the epithelial lining of an odontogenic cyst or de novo from intraosseous odontogenic rests (Oral Surg Oral Med Oral Pathol Oral Radiol Endod 2006;101:194). 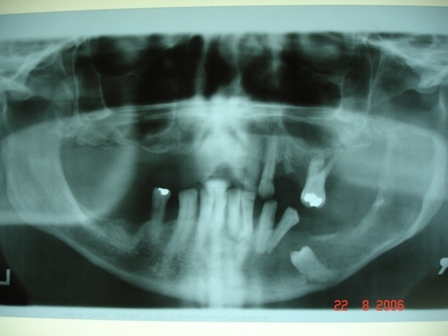 �The mean patient age is 52 years (range 4 to 76 years), with 70% occurring in men (Int J Oral Maxillofac Surg 2001;30:349).� Most tumors (92%) occur in the mandible. 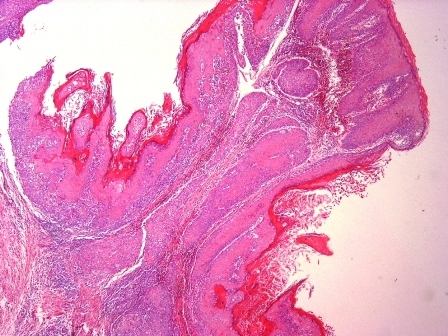 Clinically, primary intraosseous odontogenic carcinoma is characterized by progressive swelling of the jaw, pain and loosening of the teeth.� Xrays show a fully radiolucent cystic-like pattern of bone destruction, but with well-defined margins.� The histology is usually a high grade squamous cell carcinoma with aggressive behavior and a destructive pattern.� Cervical nodal metastases are common, and 50% of cases recur within 2 years.� Aggressive surgical excision is recommended (Oral Surg Oral Med Oral Pathol Oral Radiol Endod 2007;103:e29), possibly with post-operative radiotherapy.� The overall two and four year survival is 60% and 40% respectively.